When I recieved this LifeDrive, the first thing it required me to do was to reset it. I did, reluctantly, and when it began to start up again, it would "No notice" reset itself again. I was forced to hard-reset it in order to begin using it. This happened to me many times, including when I was in a meeting. Now, it won't even boot up. However, when it was not glitching, I found it very satisfying. It had an endless supply of memory, and I could store whatever I wanted-even if it wasn't compatible with the Palm OS-via the "Life Drive Manager", or "Drive mode". The graphics were superb, but many times I was not able to experience it fully because of the noticable lag. Another thing I noticed was that soft resetting it took longer than a Windows machine to boot up. There are many superlatives about this product, but wait a while for the firmware to be upgraded, because the OS included with this program is very glitchy. Palm is on the right track here with the LifeDrive, but they don't quite pull it off, and when you spend five hundred smackers, you want a convergence product that solves all of the little nagging issues. Like an iPod mini, the LifeDrive has a 4GB hard drive, but attaches a fully-featured PDA to it that includes WiFi but no phone as yet (maybe in LifeDrive 2 or Treo 1000?). You can do all the classic Palm functions, plus for the first time decent video (other Palms just don't have enough memory). 1) Up the GB level. 2) Up the battery power (new batteries being developed by Toshiba hold much promise). 3) Upgrade the sleekness of the machine. 4) Improve the software package so it will better sync with your pics and movies. That is the beauty of iPod photo -- the syncing with iPhoto and iTunes is a joy, versus a cumbersome loading process. 5) Consider adding a wireless TV dock so that LifeDrive (or more likely, LifeDrive2) can double as a DVR. How cool would it be to be able to record the Sopranos, take it to a friend's house on your LifeDrive and play it? There are ways to do this now through your computer, but it's a bit cumbersome. 6) Cut the price so regular folks can afford it, not just doctors and lawyers and techno geeks looking for the latest toy. Overall, first adopters will ignore the glitches and glow over the best attempt at a video/photo/PDA yet created, but savvy regular shoppers will wait a year for LifeDrive 2, or, more likely, for a video iPod, which could be headed your way by Christmas. Good start, but not perfect yet. I got the Lifedrive one week ago to replace a sony Clie.The following comments are based on one week experience. 1.New lifedrive manager software which in most cases obviate the need for hotsync.This is truly revolutionary. 2.Larger hard drive.Finally we are catching up with the rest of the world.You may be able to replace your iPod mini with this more versatile handheld. 3.Good voice recorder.I just got back from a meeting and recorded one whole days worth of talks from the back of a room with 60 people and record quality was quite good and no software bugs were noticed.In addition to the time allocated under your voice memo section, you can directly record to your hard drive allowing you to record more stuff. 4.This machine can store an enormous number of powerpoint presentations.This is a big plus for if you do any teaching e.g. quick review of a topic with a med student before a surgery. 5.Nice metallic finish.Looks better than cheap looking T5. 1.Poor battery life.After a whole day of heavy use, the battery dies without warning. 2.Repeated powering down of the hard drive causing a few second delay in opening new applications.Annoying as hell!!! 3.No way to customize turning off the screen after a short period of inactivity.If you play chess on this machine, it becomes annoying.By the way, Hiarcs chess engine runs quite well on this machine(Downloadable for 39.99). 4.Adobe reader formats most documents well, but some with complex formatting turn into incomprehensible amorphous text. 5.Price.I don't understand why a piece of cheap looking electronics made in china should cost this much money. 6.No integrated cell phone or camera. 7.Some applications don't run on this device.I signed up for audible.com membership to get a $100 rebate.But so far I have been unable to make the audible manager recognize this device and download audiobooks to this device. 8.It is very disappointing palm decided to put the cheaper and slower WiFi.I suspect their next device will have the faster version. 9.Size.More bulky than other palm handhelds.Not a true shirt pocket device. 10.No headphone provided.Why can't they throw in a $10 headphone for this $499 device.I am using my old sony clie headphones which works fine. Overall, 4 stars.I am sure I will find a lot more annoying problems as I use it more. Let me preface this review by saying that I did in fact order mine - it should be arriving any day and I look forward to posting a very honest review of this palm handheld. I just had to post this review to combat those many bad reviews on this item.It technically is not available yet and will not be released until the 30th of May.To all those WinCE users out there - stop complaining about items you don't even use! Now I have a long history of having palm handhelds - from my first Palm V to my current Palm Tungsten T3, I have a good viewpoint on their company's evolution (albeit slow).I recently left Palm for Sony's CLIE TH-55 which I thought was the best all-around PDA available at the time.It had everything I could ever want, and more!I decided to stick with Palm since Sony was leaving the market and purchased a Tungsten E which I was sorely dissapointed by.Long gone was the metal for PDAs from this company, as seen by their recent trend with the Tungsten T5 (plastic, plastic), and their new E2 (plastic again). I sold my Tungsten E and purchased a T3 the moment the T5 was available because that perhaps was one of the larger dissapointments in Palm's history.Well, here were are with them satisfying our needs with 4 GB of storage space, Wi-fi, bluetooth, and USB 2.0 (yes, it has USB 2.0 unlike other's reviews). So why did I order this item?I plan to have it replace my USB flash drives, I look forward to checking my email wherever I am at work or in my house with the wireless networks.Heck - even when I'm waiting for food at Starbucks or Panera I can leech onto their free Wi-fi.Battery life?I'm hoping its better than what I get with my current T3 - though nothing beats that Sony CLIE I had thus far in the battery life comparison.I'll post an addendum to this review once I've used my new LifeDrive for a month or so.Keep an eye open for my updates! I'll start with the bottom line:PalmOne has finally woken up and created a device with essential and innovative features, like an integrated mini hard drive, USB 2.0 connectivity, and WiFi.However, the price is too high, and there's a critical issue with the hard drive that you need to know about before you buy this. The big news here is the integrated 4gb hard drive - the same drive found in iPod minis and similar MP3 players.This VASTLY increases the storage potential of Palm-type devices, which of course means you can store and edit a ridiculous number of documents directly in the device. But the addition of the hard drive also opens up new possibilities for productivity that just couldn't happen with the limits of the flash memory that all previous devices have.For example, you can use the LifeDrive as an external hard drive, and you can automatically back up or sync the contents of a directory/folder structure on your computer with the hard drive in the device.You can now store enough MP3 or video files to make this device an alternative to a dedicated personal media player. The device has good build quality, is well-designed, and is aesthetically pleasing.A minor idiosyncracy is the headphone jack is on the bottom, next to the Palm universal connector. The display is beautiful, and the device features a handy button to toggle between landscape and portrait mode.The device accepts standard headphones; for music, sound quality is no worse than other Palm and PocketPC devices, but not as good as a dedicated MP3 player. Now the downside:as you'd expect, to make room for the hard drive, and the larger battery that is required to power it, PalmOne had to make the device a bit thicker and heavier.The device is 7 ounces, compared to the 5 ounce weight of most other high-end Palm-type devices.I find the weight and thickness not to be a problem, but you should be aware of it before you order yours. The real problem in my view, the thing that will be a deal-killer for most folks, is a power management issue with the new hard drive.In order to have decent battery life, the LifeDrive is designed to power down the hard drive frequently when not in use.And powering it back up causes the device to freeze for 6 seconds.So, say you're browsing the web and you want to jot some notes about an article you've just read.You fire up the notes editor, and the device freezes for 6 seconds while the hard drive is revving up.In fact, this 6-second lag happens almost every time you open a new application.Very, very annoying. I imagine this issue will be addressed in a software update in the near future, but for now, I find it upsetting, considering you pay top dollar for this device. And speaking of the price - it's just too high for what you get. So, I applaud PalmOne for taking this first step and incorporating the hard drive and other important features in their latest device.Yet, I encourage all of you to wait for the next iteration of the LifeDrive, which should resolve the hard drive issue and have a lower price tag. What's in the box: Handheld device; Palm Desktop software, including Documents To Go; all basic utilities such as Calendar, Contacts, Tasks., etc. I bought the Tungsten E to replace my Vx, that I REALLY loved and had no problem with. It held a charge for days at a time, and never gave me any problems.The only thing was, it wasn't in color.I saw my cousin's new Tungsten E in 12/03 and loved the screen and just HAD to have one.So I ordered it in January of 2004, and it worked fine, except for the fact that it doesn't hold a charge very well and I don't even use it with sound! If you use it for a full day, forget about it, the battery will be all the way down.But okay, I was fine with that.What really got my goat was that within the past few months, the power button got increasingly hard to turn the unit on.I would have to press really, really hard repeatedly, and last week, I pressed so hard that the stylus kind of went INTO the unit.I eventually was able to get it on, but now, the power button does not work without a significant amount of pressure and repeated attempts.I'm scared to keep doing this because I don't want to damage the unit to the point where it wont turn on at all. And in my crazy mind, I was thinking of buying another one, becuase I did love my Tungsten E so much!! Thank God I saw another review with someone complaining about the same problem and they mentioned that they turn on the unit with the hotkey button. I will be doing that from now on because I will NOT buy another one if the unit is almost non-functioning after only ONE YEAR.This is really crazy.Buyer beware! This was a fun little device, until all at once it all fell apart.The PDA itself started shutting down and not responding to the power on button, even when fully-charged, unless it was subjected to a "hard reset" (which erases its memory).Then, to make matters much, much worse, the software on the PC (Palm Desktop) started crashing every time it was launched.So now I have no way to get at my databases, and no PDA.If you go to the Palm support website, you find many, many threads making these exact complaints, and furthermore bemoaning the lack of good customer service from Palm.I am walking away from this device, and never ever looking back.I urge you to do the same. Even after investing in two different protective cases, the headphone jack developed problems within 4 months of purchase. Since this was beyond the warranty period, it would have cost over $155 to repair. When I ordered two separate replacement motherboards from a repair vendor, each had the same problem. Palm itself has been no help with any technical problems leading up to this defect and has not responded to any emails regarding the the problem itself. Since Sony's pulled it's clie series, I would recommend investing in a Pocket PC. Palm lost a loyal customer on this one. Please do not miss the superb review provided by JD Woody, it provides a much better description and is considerably more useful than HP's description of its own product. Also take special heed to all of the complaints by other reviewers about the touch pad feature.Unfortunately I chose to ignore them - everyone who isn't familiar with touch pads complains about them, it seems. I prefer a touch pad to a mouse any day, and the touch pad was the main reason I purchased this item, and was I ever disappointed - it's totally worthless.As a matter of fact it's intrusive, as it frequently opens/closes applications unintentionally when I brush by it with my thumb.I wish it could be disabled, but it can only be toggled between cursor mode and the NavPoint mode, which is even worse.I have had to settle for desensitizing the cursor & NavPoint settings as much as the software will permit and then handling the unit like it is a firearm. I almost sent the unit back until I discovered that it has a handwriting recognition feature that actually works - the Block Recognizer. The others that are included aren't too shabby either, but the Block Recognizer manages to recognize my horrible handwriting 98% of the time. Because of the Block Recognizer and the many other useful features the iPAQ 4705 provides, I've decided to keep the unit. Hopefully HP will provide a software update for disabling the touch pad in the near future.Or dare I wish for an update to make the touch pad actually useful. by the way can any one tell me if i can use the 5gig cards??? Overall, I'm very pleased with it, but there is a problem. HP just published an update on their web site, that limits the volume applied to the internal speaker. Apparently, the internal amplifier is too powerful for the speaker, and without artificially limiting the audio level, the speaker will be damaged. Mine failed this way, and now it will be two weeks being repaired by HP, assuming that they don't decide to charge me a minimum fee of $85, and there's also the shipping. So, my nice Ipaq will be out of service for a while. And I was thinking about having that ram upgrade installed, which would have left me with no warantee.. This is my fifth Pocket PC atfer migrating from the honorable palm line.I must confess that Ipaq hx4705 has all I have be waiting for in a compact pc. Just name but a few,,,security, speed, view, touch pad and size. The backup is so great that with my ipaq off and password protected, it still does the daily backup assuring me that my data will be available no matter what happen. The backup to my Ipaq file storage is one of the thing that make me want to kiss my ipaq.I did a hard reset just to put the backup files to a test.I am proud that the restore process was easy and I got my ipaq back the way it was before the hard reset.HP, the security and backup system in this model is a great step up... The VGA IS EXCELLENT.. 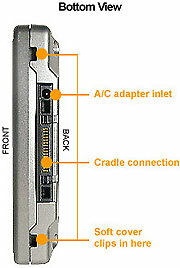 If you are in the market for a high end pda, don't hesitate as this is the right pda for you. So far I think it worth every dollars I've invested on it. I must say I am proud to have invested on this little machine. Storage is unlimited. I have 2GB CF AND 1GB SD CARDS on my Ipaq. Now I have more than enough room for any thing I can possibly load on it.......Just a Perfect machine and technology. Have used the Ique 3600 for 9 months or so now, I find it to be an extremely powerful and synergistic combination, and would recommend it to those with PDA experience and/or patience.A PDA is a natural mate with a GPS and Garmin has done a pretty good job in this combination.I do understand the frustration of some of the reviews posted here though, as there are a few quirks which can make the initial experience less than smooth.But if you hang in there to get past the learning curve of futzing with the maps during 3 or 4 downloads and figuring out how to work with the address book and the 'find locations' feature, you will then have a powerful ally in your daily life's travels and travails and will not part with it for a minute. Recommendations: get as big an SD card as you can, 1Gb or more, and put the whole dang US map on it and forget about tweaking it for every trip, since the download process is pretty painful. Also, leave it in the charger every night, as it needs a charge pretty much once a day.Gotchas: popping it into the car holder will occasionally glitch it due to static on the connectors, requiring a reset.Try to touch the connectors of the car and the PDA while it is still off before popping it in in order to discharge the static. Great Product! One of my best purchases, ever! I have wasted money on a lot of things that prove to be only half as good as they appeared to be. This product definitely exceeded my high expectations. I travel a lot, and many times, to places that I have never been before. This product was a life saver because it gets me to where I need to go every time, with only a few minor errors (i.e. newer streets not available, address slightly off on smaller side streets). However, one should not expect that it can be perfect every time, even though it does get it right more than I expected. I have been using Palm OS PDA's for several years now, so I was really excited when a friend told me about this. The PDA on the Garmin iQue 3600 is probably equivalent to a higher-end Palm-brand PDA (i.e. Tungsten) and it has worked out great for me since I took it out of the box. Please, keep in mind that this item is a PDA with a really good GPS navigation system. If you want a strict navigation system, Garmin makes a few products that are better for that purpose. 1. Integration of address book and GPS allows to quickly route to an existing address book entry or set up entries as waypoints for even quicker access. 2. Tremendous list of stores, restaurants, etc. allows you to look up items near your current location, near your destination or even near a point that you choose on the map. 3. It recalculates! If you miss your turn or make a wrong turn, it will automatically recalculate your trip based on your new location and make sure you still get to your destination. 4. It is extremely mobile. It does everything a PDA needs to do and you can use it as a handheld GPS device while you are walking down the street. This is great in larger cities when you cannot always park in front of the building you need to go and you need to walk from a parking garage, or if you road in a taxi or took the subway/metro. 1. The poor battery life. I can understand the battery being drained quickly when the GPS is on, but when I am updating my contacts or inputting appointments it should not burn out the battery so quickly. Be sure you have access to a charger if you think you will need to use it a lot during the day. However, I have not had any problems with the battery draining significantly when I don't charge it for several days and it is not being used. 2. The maps cannot be modified (or at least, I have not figure out how to do it). This is not a serious problem, but there was one instance where there was a new road near my destination that would have significantly reduced my travel time. The iQue didn't know the road was there and I could not add it for future trips. I just had to remember to ignore the last part of the directions and the iQue made it look like I was driving "off road" during that point of my trip. 3. It takes a little while to upload new detailed maps. It never took up to 1.5 hours as one other review mentioned, but it is not a quick process. The few times that I did it, it took about 25 minutes for the software to prepare the maps and perform the hotsync. However, you should only need to do this every once in a while, unless you constantly need to change maps or you don't have enough memory to store all of the maps that you want. Regardless of any slight imperfections (as most products have), I plan to buy this product for my wife and for my mother. That just shows how much it has been a benefit to me and how much I can trust it. I bought it as Christmas gift for my gf, and she loves it. It generally works fine, but with a few problems. Other reviews talked about most of the good things about it, and I agreed. So here I will only talk about the few flaws. Overall, it's a usefull tool; but don't rely on it too much and it's always wise to still keep a copy of paper map in your car. The system sometime couldn't find the signal, but a soft reset will solve the problem. I once waited for 20 minutes and it still couldn't find the satellite signal, but after a reset, it founded the signal within one or two minutes. I couldn't have it figure out the fastest way. Even though I selected that option, it always gives a seemingly to be shortest way. I KNOW these are slower than some alternatives. It just doesn't know about traffic information. Voice prompt sometimes inaccurate. When she says keep left, you may be turning left or even turning right. The maps is right most of the time, though. It's always a good idea to have somebody sitting in the passenger seat to double check with the map, or look at the screen yourself. The big screen makes it relatively easy if you position it well. The "Find" function works some time, but not all the time. Sometime it puts stores in wrong categories. For example, I couldn't finda Stop&Shop store in "grocery shopping" but it's in some where else. The weird thing is that I was able to find another Stop&Shop store in grocery shopping category. The maps are ok, but I couldn't find a pretty large mall in South Boston, even though the mall has been there for more than 3 years. The whole area in the map is just dark. btw, I've loaded the detailed map of the whole New England. One great thing about the iQue is the mp3 player. However, it's pretty hard to organize the songs. We have a 1G SD card in it, about 200MB maps and 500MB mp3. There's no playlist function in the palm, and all songs appear in the same directory. I hope they will provide a firmware upgrade that support sub-directories. When playing mp3, we once experience terrible high volume sounds. After turning down the volume, the problem was gone. The same song plays great on my PC. I guess it's probably the problem of the palm audio output, too easy to get saturated. The palm cannot remember where you were when palying mp3. Everytime it starts from the very first song when turned on. If you don't want to listen to the first few songs for many times, don't turn it off. The speaker of the car kit is terrible. Fortunately I have a cassette through which I can play the palm sound output using the car audio system. Now the car kit speaker is just a cumbersome junk which cannot be removed because it's made into the car charger. The friction mount works great, though. 1. Car moves out of map and map must be moved;This problem does not exist in my replacement Garmin. 2. Batter live short:A little better on the replacement. 3. Hang-up and needs reset!About trashed the old one, but the new one I received does not have this problem. 4. Slow map loading:A lot faster on the replacement. I am a Realtor, and this is one of the best investments I have made.They could give better instructions on using the GPS functions.They leave a lot to the trial & error method.I am still trying to figure out all the bells and whistles that come with it. Affordable color. Another bright idea. Not only fits your busy life. But also your budget. Life is best seen in color. Take the Zire 31 handheld from palmOne, forexample. With its bright, colorful screen, it turns your busy schedule intoa dazzling display. All, we might add, at a price within your budget. Keepyour schedule, look up phone numbers, store photos of family andfriends, even play MP3s1 or a game. See things clearly on a color screen. A display thats bright, colorful (with support for thousands of colors), and easy to read is exactly what youll find with the Zire 31 handheld. Whether youre at home, at work or at school,you can organize your day, view photos and even play a game, seeing allof it the way it was meant to be. Be as organized as you want to be. palmOne is always looking for ways to improve your life on the go. Thatswhy an Agenda view lets you stay ahead of your day, and the ability toattach a photo to a contact means you can always put a name with a face.Your Zire 31 handheld synchronizes with Outlook and offers color-codedcategories so you can track your schedule and those of your family, work,school and more. Carry your tunes with you wherever you go, and listen to them using thespeaker or add stereo headphones1. The Zire 31 handheld wont slow youdown, either. You can play MP3s while youre scheduling appointments,adding contacts, or just enjoying a spare moment. With the Zire 31handheld, your life just sounds better. 1 Expansion card required; stereo headphones optional; both sold separately. Like all the other reviewers, I was happy with my Zire 31 for the first four months of owning it...then one day it just did not turn on.I did a soft reset...nothing.Hard reset...came on for a moment, then again it DIED.Now it is worthless, I got 120 days of use.Warantee is for 90 days.Don't waste your money. What a piece of garbage.It works great, but look out, because this product is a heartbreaker.I'm probably the 20th person on Amazon that has had this issue:One day I shut off this device, and it no longer works correctly.No, that's probably the understatement of the century: IT DOESN'T EVEN TURN ON ANYMORE. So let me ask you, PalmOne:Do your customers mean nothing to you? Does your very source of revenue deserve to be treated like garbage? I am awaiting tech support for this issue.I am extremely angry at PalmOne.How is this any different from stealing $150 dollars from my wallet?I work hard for my money, you corporate sleazebags.Don't buy this handheld. This is my first PDA, and I chose it over the Tungsten E which cost a third more in price (Tungsten E2 costs 2X the price... out of my budget). The contoured white plastic back looks great, like a prop from Star Wars, instead of the plated metallic of the T|E. The 160x160 screen is also 1/4 of the T|E's resolution, but sufficient for most apps, even Palm Reader. The MP3 player (Real Player) can play any mp3 files on a card (no DRM hassles), highs and mids sound great but the bass is a bit clipped (like most low-cost flash MP3 players incl. iPod shuffle). It has a strong audio amplifier, so there is some background hiss at low volumes... but you can remove the noise with any inline volume control (resistor) equipped headphones, turned to minimum. My choice between T|E and Zire 31 is the based on photo viewing need (or doing w/o it)... the T|E with 4X the resolution and much better color (a real TFT) makes it more useful.... but since it has a weak CPU, it cannot play full res video on its excellent display. What a waste, so I compromise a bit and got the Zire for only its classic PalmOS functions. I love the efficient user interface, as well as the Zire's simple design. 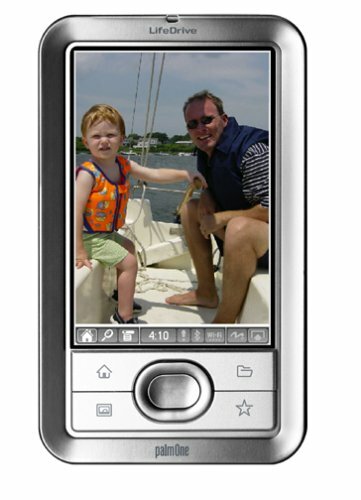 Looking forward to the Zire 41 or 51 as my 2nd, next PDA. Great PDA for starters - I love it! I bought this product a month ago, and am still very happy with it. It is my first PDA and it meets all my requirements: keeping track of my timetables and appointments at school and social life. The Graffiti writing is very easy to learn, and the interface is very user friendly. A great amount of free software is available for this PDA, but gaming, hovever, is a disaster on this PDA. I get the idea that a lot of games designed for PalmOS were intended to be played on PDA's offering a lot of buttons, like some previous palms. Only very simple, but nonetheless cool games can be played on the Zire 31. To conclude, if you're a first time PDA user, this one is defenitely for you. But don't expect it to be a gameboy or something. Don't hesitate to email me if you have any questions or suggestions. Good if you never have to use it outside. well I love this product.love its memory capacity.love its ease in transferring of information from pc to handheld.love its flash drive capability... no more lost data cause the battery ran out!my deal was awesome I got a hard case with free rebate and a free keyboard.I am very happy.I had only one soft reset to handle a problem with my beam. its pricey but the best out there in my view.note* i purchased an additional warranty for workmanship and technical difficulites.i havent had to use it for workmanship but have made some calls to the technical dept all free and all matters thoroughly handled. Like several other reviewers here, this is not my first Palm device. I started many years ago with a US Robotics 500, upgraded that with more memory and an IR interface. I eventually dropped it and broke the screen so I upgraded to the (then) new Vx. I have used that until I got my last laptop and it didn't have a serial port (no way to hotsync). Now I have updated once again to the T5. The T5 is a great device. I gues it could have a metal case and WiFi, maybe multiple memory slots, how about a CF slot for a MicroDrive? A Microphone? Sure it would be a better device with all that. But then it would be more expensive too (and since I never had any of that to begin with, I'm not missing it with the T5) I do miss a docking station though. It has enough new 'toys' to play with (MP3, Photos, Color with large format screen, expansion memory) that I feel like I'm getting more than I had before (other than just USB sync'ing). I recently went from an iPaq to the T5, recalling fondly how much more stable the OS was on my older Vx compared to Windows CE.How things have changed.The reset pin has turned out to be the most valuable accessory provided, and it gets a regular workout.No Wi-Fi?Really? Whose enlightened decision was that?This is a classic example of a product designed in a vaccuum, with little or no regard for the needs and expectations of the customers who keep palmOne in business.I live overseas and the tech support one gets from Singapore is, while courteous, wholly ineffective.I have been walked through unnecessary processes that border on comedy, and find myself running a mini-tutorial for them (on my dime) each time I call.The T5 is a paperweight.It will mean nothing to them, but palm has lost another customer. *Great color screen. The clarity and brightness is better than the ones on my Clies. I've yet to see a PDA with a better color screen than this. Go to a retail store and check it out for yourself in person. It's fantastic. *Large internal drive. It's great to have the extra internal memory in addition to the ability to use an external card. It's live having two card slots. This way I can still keep a lot of apps on the handheld while swapping out the external card for movies or playing MP3s. *Plays movies beautifully. There is a free player for Palm OS devices on the net called TCPMP. It does a great job of playing movies on my T5. I just love it. To convert regular DVD movies for my T5, I use Pocket DVD Studio. *Non-volatile memory. I just hated losing all my data with my Clies whenever the battery drained or I had to do a hard reset. And this used to happed with regularity. With the T5's flash memory, data is retained on battery drains, though not on a hard reset. The good news is that in over a month of use, I've never had to do a single hard reset. Soft resets, yes. But not one single hard reset. So this is the most stable my data has ever been on a handheld. I like the T5 much better than the clunky slider design of the T3 which annoys me. Some complain about the design and finish on the T5, but to me the design is sleek and stylish. And I can't see anything cheap or flimsy with the finish. It feels solid and well-made in my hands. The T5 is not perfect. There is a slight hiss in the audio, which is otherwise of excellent quality (loud, clear etc.). The hiss is most noticeable when you wear the in-ear bud type headphones. So I simply use my external type compact headphones with my T5 and all is good. Still, this is something that PalmOne shouldn't have overlooked. Another thing to be careful about is the new file system the T5 uses, which is a little more finicky than older Palm OS systems. Some apps simply won't work well with it. However, I put well over 50 apps on my T5, and only about 3 or 4 I had to remove because of incompatibility. If you get a T5, make sure you do a clean install of all your apps, one by one, testing each as you go along. That's the only way you can weed out the apps that won't play well the T5. This is what I did and while I may have to do a soft reset now and then, I never have the need for hard resets. If you have the patience to do a clean install like this, you should end up with a T5 like mine -- a relatively stable device that handles MP3s, movies, and graphics beautifully,in addition to doing all the traditional things a Palm device should! I agree with all of the other 1 and 2 star reviews, with the exception of battery life.The battery on the T5 is much better than previous builds. The T5 is truly a promising machine with many new features and memory improvements.Beautiful screen, navigation, etc etc. - The clock, when it decides to go off, and other alerts such as meeting notifications will keep the T5 energized if you are not there to acknowledge the alerts, thus completely draining the battery. - The data entry interface regularly misprints your stylus inputs, and is very slow to update once you've written a character. - The T5 is not a sturdy device.Very cheap case and buttons, which sometimes need to be pressed twice. - Many soft and hard resets, never for any apparent reason. The list could go on to include the new plug device that doesn't interface with any other accessories, or the lack of voice recorder, wifi, etc. Although the Zire 72 has fairly decent screen resolution, other features (or lack thereof) make it not worth the price.The battery life is terrible.After only 10 to 12 months of occaisional use, the battery in my Zire will not hold a charge for more than 10 to 20 minutes, and PalmOne wants $125 (plus shipping)to replace it.The blue paint began flaking off within days after I bought it.I just scraped it all off with my fingernail and the rough, brushed steel look was OK.
My first color Palm OS handheld! 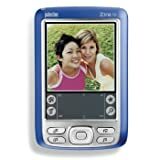 All I can say is that PalmOne has really impressed me with their Zire 72 Special Edition!Perhaps I'm so taken by this PDA because I upgraded from a Handspring Visor Deluxe.I would give this PDA 5 stars if it included 802.11x wireless networking instead of the Bluetooth support. That costs one star! Overall, I would definitely recommend this PDA to anyone interested in buying a new one.It's FAST, the color 320x320 screen is awesome -- very crisp text on this brilliantly lit color screen!I have yet to try the mp3 side of the handheld.That really isn't something important to me, though for many it is, and I have read reviews that say the sound quality is quite poor.Don't just take my word for it though -- do some research using Google.com to find reviews. Battery life is simply sufficient; however, what do you expect with all that it does? Well, the OS does some quirky "background" stuff when alarms are set or when the auto-off-and-lock feature is activated, etc. All in all, I've loved it.It's been great! Overall its not a bad product, it does do a lot. The different language programs to read different types of languages has not caught up with it. Nonetheless its good with letters. However, mine stopped recharging after the initial charge to start using it. Apparently it can often be damaging to carry it too close to certain kinds of cell phones. I don't undertand since it has a blue tooth function, what do they expect? Anyways I CALLLED PALM, and they wanted to CHARGE ME $40 TO "EXCHANGE" it with a new one, which I do not think is fair at all. I recommend purchasing some sort of insurance that would cover it so that you don't get ripped of by the "EXCHANGE" costs of replacing it. If you want to buy it, just hope it won't show "route calculation error".Here is the email I sent to them last year and I am still waiting for reply. I called two times hoping to find answers of "route calculation error".Unfortunately the problem still exists. For the first time I used my new iQue 3600 during my trip to San Antonio, TX on August 6 to August 8, 2004.I was amazed at the functions the small one offered.It helped me a lot, especially in the downtown area.On my way back to home, the iQue stopped working and the "route calculation error" appeared on the screen.I had big trouble to find home back. After I got home, I called tech support and after several attempts I was told to reload the map.After reloading the map, the route calculation error disappeared temporarily. Today, August 24, I received my friend's new address and I couldn't route to her address and "route calculation error" appeared again. Today's customer specialist, Doug, after several attempts, still suggested to reload the map.To me it is not an option anymore to solve the problem.I can not reload the map all the time, especially when I am away on road without my computer.If I knew that I would need to reload the map so often, I would not buy it in the first place. Anyway you know your products better than me.I hope the problem can be solved quickly, otherwise I have to request the return of the product either to the store or to Garmin. Good Product, but does have some faults. I bought this unit several months ago in anticipation of trip to Italy because of the detailed maps available through Garman. Well, the street detail was breathtaking! Venice is a very complex city with alleys & tiny streets that are bunched together in an impossible maze. As long a I got a clear signal (a drawback of any GPS unit)I knew EXACTLY where I was. Walking directions were right on. But, back stateside I started seeing some limitations with the unit: 1) Driving directions were not that great, taking you on round about routes in spite of requesting the least # of turns and/or highways (not side streets), 2) the battery life is terribly short and needs to be put back onto the cradle for re-charging, 3) it's a rather fragile unit - I'm somewhat of a klutz from time to time and have dropped the unit which then needed to be reset. The PDA part of this unit was a welcome bonus. I purchased a 1GB memory card which gave me the maps I needed plus plenty of extra memory. I loaded Pocket Quicken on it which enables me to keep track of my personal finances away from my desktop. Overall - worth the investment. Really nice product and worth every cent.I own a Garmin StreetPilot and have used a Palm PDA so I found this really easy to use.The ability to drag maps around to find places is amazing. The integrated PDA functionality really adds value.A must for anyone in sales that travels (you could actually know where your taxi is going and where to find dinner in any city). 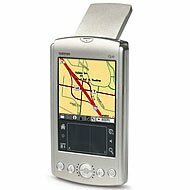 If you are just doing navigation for your car you could just go with a StreetPilot - a bit easier to use.My third great GPS from Garmin. PS. Some of my kids first words in the car "turn right daddy" - copying my nav systems audio - Dad's car talks! My 3600 GPS did not work the first time and was returned.After a new one was sent, it started working well.There are two detailed manuals which you should study (I downloaded and studied while I was waiting for delivery).For clarification on their 'too detailed instructions' I had to call their service about 5 times each spending 20 minutes on hold.Now that I have had it I can't do without.It is accurate 9 out of 10 new addresses I enter so don't trust it 100%.I use it everywhere (East coast and West coast).I use it to get to any new address and very valuable even trying to get out of a large parking lot after I arrive.After 3 months I started to use it to find shops and eatery while on the road.If you don't remember exactly a specific address, you can get there if you remember a store close by.The unit requires a soft reset every few weeks.The biggest plus is that you never lose your addresses because you sync it up with your home computer. 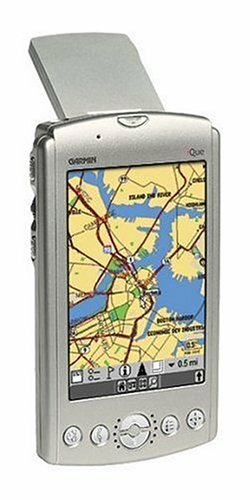 There is a selection of 'fastest path or shortest distance' which could be confusing if selected wrong.I realize there are other GPS which are more costly, longer battery life with larger fonts but for the money it is the greatest product since the PC. Excellent product and very useful. I moved to a new city and bought this PDA upon my friends recommendation and I must say that I am very pleased with it. It has been of great help to me when I get lost or am exploring new areas of the city. I've been buying Palm handhelds from the very first one (Palm Pilot). I've been periodically upgrading to the next model... UPGRADING???!!! It seems that the company is going backward running against quality. The first ones came in good and robust plastic body, well assembled. Then they made the m500 series very good finished, in a metal body. Since then the handhelds come now in a poor plastic body, metal like painted, that easily scratchs showing the white plastic behind. The Stylus peel off (m500's). The brand and model in the front of the machine come off in a few days (Tungsten E). 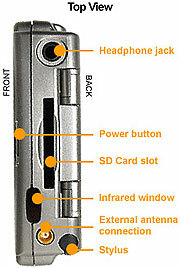 The flip cover simply breaks apart after months of use (Tungsten E), without chance to be replaced because palmOne doesn't sell it as an accessory. Now I bought the E2 thinking is was going to be better than E and, sorprise!!! It's slower. Even the stick in the Stylus we use to reset it is so weak that bends when we make the minimum pressure on it. The E model got charged throught the USB cable, great advance! and now its successor doesn't do it. What's worse, same thing happens with cameras, cars, and so on... higher prices, less quality!!! At this point, I am not pretty sure I will remain being as loyal with palmOne handhelds. Next "upgrade" I'll be for sure checking other brands. Stop doing this, get back to basics please!!! I had a m515 a couple of years ago when it crashed and never woke up. I somewhat apprehensively decided to get this Tungsten E2 mainly because it has non-volatile memory and so here I am. First about the case itself: It is a solid case with a solid look of steel and I suspect that this is for a reason along with the fact that they got rid of the cradle systems. Traditional Palm PDAs did come with a cradle and they did have quite a bit of issues with the SUDS (Sudden USB Death Syndrome). The steel finish is elegant but it does leave smudges which is managable. For whatever reason they decided to leave this finish, personally it is fine with me. I don't get it when people complain that they are dissapointed when there is no cradle. Good thing I don't have to lug a cradle while travelling and if not will have to buy a travel charger. Compared to the previous m515 I've had, this is a steal for $249. The interface is very good and I really like the crisp display. All in all, looks like they took the best of the Tungsten E model and improved it. It took a bit of time figuring out to play mp3s using the Realplayer. I had to format my SD Card using FAT instead of the FAT32 file system. After this step, adding and removing songs was a breeze. I must say that I am totally blown by the music quality. Agreed that the built-in speaker isn't meant for this but on a headphone it is awesome. The operation speed is pretty good and a 10 hr battery life doesn't hurt at all (mighty impressive). Haven't played around with Bluetooth yet and it's dissapointing that if I need wireless, I've to shell out another 100 bucks for it. For now, I am satisfied with the base version and I don't think I'll go for wireless anyway. Additional SD Card would probably be a good idea if one needs more songs on the go. Bottomline is that this is a decent PDA for the price (which is bound to go down shortly) and if you know the limitations and capabilities and don't have high expectations you'll be satified. Just keep your fingers crossed if your unit goes bad and is out of warranty (Palm support has been legendary in being terrible). Hopefully we don't have to deal with it. Way to go palm, you did it again. Other than that, a grat buy at an affordable price! There is a reason, sadly, why sales of PDA's have shrunk each of the past few years -- a crushing lack of imagination and innovation -- while rival gadgets competing for valuable pocket space, like Apple's iPod, have taken up the slack and have seen booming sales as a result. The Tungsten E was a breakthrough in its time, a beautiful piece of engineering with a high-quality color screen and a rock-bottom price of 199 clams. Its main drawbacks -- it's paltry 32MB Ram and it's lack of built-in wireless capabilities -- could be fixed with add-on cards. But two years is a long-time in electronics land. Since then, Apple released the iPod mini, which will store the contacts most people use Palms for, plus hold 4GB worth of tunes, for the same price. It's also far smaller than a Palm. Meanwhile, folks who want the more sophisticated functions that a Palm can deliver -- like medical imaging etc. for docs, photos, sophisticated calculator, email and web surfing on the go -- found the Tungsten E outclassed by Blackberry's, upgraded cell phones, Palm's own Treo and the like. So it was odd, and frankly disappointing, to get a look at the new, pricier Tungsten E2. I'd love to see the market research that suggested they could raise prices with a minimal feature upgrade while the competish has been eating their lunch. After a two-year wait, they didn't even increase the 32 MB memory. They merely made it non-volatile flash (something they should have done long, long ago). 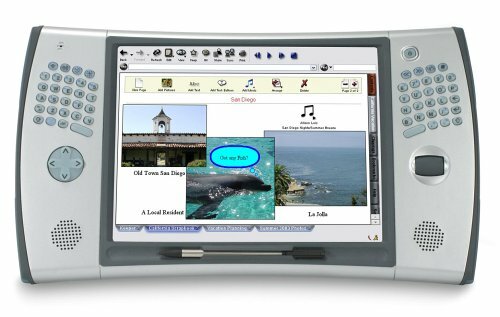 At a time when Apple is selling a 1GB shuffle for $149 and flash memory is dirt cheap, it's mind-boggling why Palm would choose to link the E2's fabulous hi-res screen to low-rent memory. As for what you still don't get: There is no phone, no camera, no thumbpad, no WiFi. This is close to a pure PDA, though it can display pictures and double as a poor-man's MP3 player. The added bluetooth -- odd why they went that route instead of the far more common WiFi -- does nothing unless you have a compatible bluetooth phone or computer. As with the E, the E2 still is a great design. Clean, simple, portable, shirt-pocketable. No keyboard, but I've never been a thumbpad fan. Mono Palm Zire -- Bargain basement model with 7.2 MB of Ram, upgraded from hobbled 2 MB original model. About 100 smackers. Often offered free as bundle deals with new computers. Good starter model for the price, but designed to leave you wanting more. Includes rechargeable battery. Memory can not be upgraded. Horribly skimpy black-on-grey screen. Tungsten T2+, etc. : Deluxe models that feature, in some cases, larger screens/Bluetooth/Wi-Fi/thumbpads with dropdown graffiti screens. All unnecessary features in my book, especially given their much higher prices. Zire 72: Similar to E2, but with a low-rent camera attached. 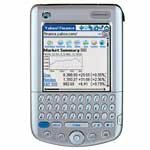 Treos: These models should be seriously considered if you are a thumbpad fan, or if you want your PDA to also be your phone. But let's face it, how many people can afford spending several hundred smackers on a PDA? BTW, when comparing, I've found you can generally ignore the speed of the processor. For most Palm functions, the reaction time is near instantaneous, or at most a second or two lag. As for PocketPCs, some of them are now very attractively priced and are worth checking out. I've yet to use one extensively, so I'll stick to what I know -- Palms are simple, easy to use and almost guaranteed to improve your productivity. It's like having a backup for your brain. And who doesn't need that? 1.For most of the things that anyone does with a Palm, it works great.In other words, the PIM features work great, and the direct synchronization with Outlook is fantastic (and a new feature only on the past few Palm devices). 2.The hardware and "fit" of the device is great.This is the latest in the "Palm V" model and it shows.No gimmicks, just a good device fit and design wise. 3.The Bluetooth feature is great, if you need/want it.Setting up PC Bluetooth sync is easy if you follow the manual and the wizard on the device.Using it with a phone is a much greater challenge due to the few phones supported directly by Palm.Check first to see if yours is.If not, there might be a work-around, but prepare yourself for a few hours on the internet trying to find one. 4.The fact that the memory doesn't get erased when the power runs out will be really helpful if you're prone to forgetting to charge your devices. 1.Versamail is incredibly difficult to work with.By far it has taken me the longest time to find out that I can't use it to sync with Outlook as planned (this is because you can't directly Hotsync IMAP accounts with SSL security, nor can you sync an IMAP account to Outlook, points buried in Palm's website). 2.As mentioned, getting Bluetooth to work with an unsupported phone is a real pain and not the most reliable connection ever invented. 3.Yeah, yeah, it shows fingerprints, should have a power indicator light, and a cradle would have been nice.A little too much cost-cutting, I think. I would give this iPaq five stars were it at least $50 cheaper. Seems to get in line with the competition it would have to be $100 cheaper. But price aside this is a wonderful PDA. I've had a range of PDAs from the first Palm Pilot, Apple Newtons, Philips Nino, Psion Series 5, Sony Clie, and more, and this is overall the best one yet. It's a very small and light package full of features. I love having wifi and bluetooth built-in and it works fine with our AT&T wifi at home and at a local coffee-shop. Battery life is amazing. I've easily watched two feature length movies without running out of battery, and I can easily go a few days of normal use without a recharge. Is all good? Well, no... the case that comes with the iPaq is pretty much useless. You're going to have to spend more money on a decent case. I got a Krusell Multidapt case. The screen seems to scratch very easily but that's common among these devices and you need screen protectors anyway. The HP software is not the greatest and you're going to want to get some other software to do some things. Overall, a very good PDA, albeit a bit pricey. Excellent pda. Love the wifi feature that allows me to sync with my mainframe computer and other digital devices. 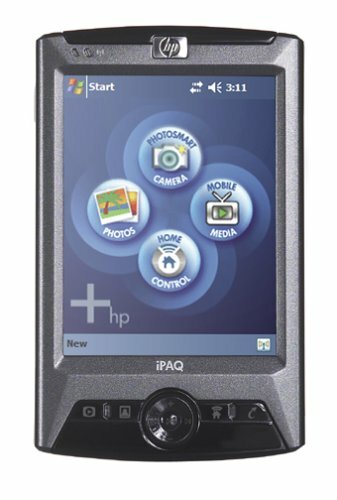 The large IPAQ memory is a plus and the camera comes in handy when you need to take pictures unexpectedly. It does not freeze up like my previous generation pocket pc. Absolutely love it. This is an absolutely amazing pda!I love it.The processor (400mHz) is faster than half of my school computers.Taking and editing pictures on the go is a breeze!video capture is astounding.152 mb of memory!The wireless is better than my laptop!battery live is good enough for 3+ days of heavy use.landscape mode is great for viewing webpages.What more can I say?I am actually typing this on my pda right now!I love it! This toy is a blast. I love it, even at the outrageous $499 price tag. It's fast, bright and well-designed. I've had countless pocketPC's over the years and am quite pleased with the design, battery life, performance and form factor of this one. It goes with me everywhere. Just two complaints. First, the camera really is a joke, in that pictures are pretty low quality and it handles moderate lighting levels poorly. But, then, who really buys a PDA for a camera? It's nice having camera capabilities, even if they're not the best. Second, I've had just a wee bit of trouble with the wireless network streaming capabilities of the NevoMedia -- it doesn't work except for photos -- but I'm still happy with HP's hardware. Got this as a present for myself.Now, not only am I a geek, I'm a geek that can check his email wirelessly with a PDA.How cool is that? I've been a long-time Palm person (and a Newton user before that--but that's another story) and this is the best one I have seen. If you like Grafitti, you don't need this.Get a Tungsten and a wireless MMC card.However, if, like me, you think grafitti really isn't that good, this keyboard is excellent and you don't need grafitti at all.I'm able to dash off quick emails with it without problems. Anyway, the C is great--worth, in my opinion, the premium price. this time that I've had it. a plus when used with your favorite IRDA enabled cellphone. program that has its limitations, but useful otherwise. the product is good and will be of great use once you have it. Tungsten C is a great product when it is working but when you need support forget about it. The support number you call is not a toll-free number and they keep you on hold so long that you don't even want to bother. When you finally get a hold of someone they can hardly speak the english language. PALM SUPPORT is the worst and the next time I think about buying a new PDA I will probably get another brand. It is too bad that this company can't back the great product that they sell!!!! I've had my Tungsten C for 6 months now and it is the best Palm I have ever owned (and I've been through quite a few).At first I thought I wouldn't like the thumb keyboard, boy was I wrong - it is one of the features I like the best.You can enter text so quickly, compared to using grafitti.And the Wifi access.Another great feature.All-in-all I highly recommend it.If only the screen was bigger. I was considering this or a T5 after my T3 died within the warranty period as I needed someting to work with while waiting for repair.In December 04 I sent the T3 in for repair after talking with support.It came back within 7 days! However I soon found that Palm sent the same T3 back to me unrepaired with no explanation. Back to support calls again, they say to send it in again.They get it on January 24th.I get no notification they have it. (Glad I sent it Fed Ex to check delivery! )I call mid February and am told it will ship Feb 23.It is now March 15 and no T3 and no word from Palm.The so called repair status on thier website which is supposedly updated hourly has not changed since 1/25/05. On April 4th of 2005 our house was flooded and a cleaning crew came in to clean it up. 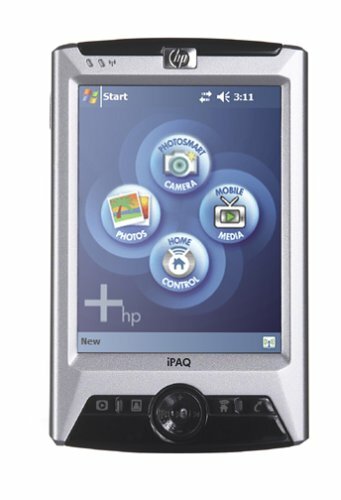 One day my HP iPAQ 2215 was on my desk, the next it was gone. So, I knew two things, someone had my handheld, and I needed a new one, so two weeks of searching turned up the HP iPAQ hx2755. I got the hx2755 a few days ago and I really like it. The biometric fingerprint reader is a nice addition and the wraparound rubber grip is an added touch. I like the size of it and the VGA screen. There are some things I am troubled with, though. It has no Nevo! I loved Nevo on my 2215. HP should really have added that. But that's really all the problem I have with it. The HP iPAQ hx2755 is great for business or oriented people. . . Or 9th graders, like me, who have $550 and would rather spend it on technology than whatever their classmates are spending it on. The issue mentioned in the previous review regarding the conflict between calligrapher 7.4 and windows mobile 2003 SE appears not to be an issue on my machine, which I have had for about 10 days now.The system is completely stable.The crash experienced by the previous reviewer could only be due to other software conflicts. And yes the machine rocks!Very happy right now. I just got the hx2755 a couple of days ago.Overall, I really like the PDA.It fits in your hand better than the 2200 that is replaces thanks to the wraparound rubber grip.The buttons are all in the same place that they were on the 2200 but look better on this model.The screen is big, bright and clear for a QVGA.As for performance, it rocks!I can surf the net faster via wi-fi faster than my old pentium II laptop can on the LAN.I have placed all the installed programs I have in the extra 128meg nonvolatile storage, so I don't have to worry about resetting the thing up if it crashes (more on crashes latter.) It's great for previewing images on a compact flash or SD card and I've even watched a couple of movie clips on it.The bluetooth and wi-fi have great range for a unit this size and were easy to set up.And of course, there's the security features.I set it up to lock when turned off. To unlock, all I have to do is swipe a finger. The fingerprint recognition is great on this unit and far more secure than the 4 digit "pin" I was forced to use to save time on my old 2200.Additionally, for the true PDA paranoid like myself, it has a automatic backup that can be configured to back up the entire devise if the battery gets too low.I can't count the number of times I lost all my data on the 2200 when I forgot to bring a spare battery on a weekend trip. Now for the down side.It did crash several times and I had to do a complete reset.I finally traced it down to the new Windows Mobile 2003 SE and Calligrapher 7.4, they just won't play nice!Pity, Calligrapher is a great program, but once I removed it, the unit stopped freezing up.Additionally, you have to remember to turn the wi-fi off when you turn the hx2755 off or it will "wake" periodically and run down the battery.The included Microsoft Internet Explorer is better in the SE version but still isn't compatible with many secure sites like Wells Fargo and does sometimes close unexpectedly.Once again, Microsoft has given us a beta version as a "final" product.And last, the hx2755 is so new there are few dedicated accessories available. Great device for a great price! The iPaq hx2415 is my second PDA.It is replacing my slower, but still fully functional Compaq iPaq 3635, one of the original iPaqs.I loved it and used it daily for everything from productivity to entertainment.My review is going to be more of a comparison between the two devices. The hx2415 is awesome!It's everything I had in the 3635 and so much more.Because my 3635 did not have any built-in expansion card slots, I had the compact flash expansion sleeve, which added bulk and took away from the slim, ergonomic style.In searching for a new PDA, one of my main requirements is that it would have to take compact flash cards natively, without an attachment.There are others on the market, however, I never had any problems out of my Compaq so I wanted to stick with the HP/Compaq brand.Not only does the hx2415 take the compact flash, it also takes the secure digital (SD) cards as well!Great job on providing multiple expansion slots HP. I have been doing research and looking at the newer PDAs for about six months.The vast improvement in the displays just blew my 3635 out of the water.The colors are brighter, sharper and much more crisp on the hx2415 and the newer PDAs.Without a doubt, it was much easier on the eyes, even with the screen protector that I put on, right out of the box. I bought my 3635 new in the summer of 2001.I replaced the battery myself with a high-capacity battery.The original was down to about 20 minutes of good usage per full charge! :(After the new battery, I could go for a week and a half with more than my normal daily usage and the backlight on!Having said that, the standard battery of the hx2415 doesn't compare, which is why I'm getting the high-capacity battery for it as well.I love the fact that it is removable and I don't need any tools to replace it. When the iPaq was first introduced, it's radical style was on the cutting edge.One of the main reasons I bought it is because it was unlike any other PDA at the time.It made all the Palm devices look like standard calculators.I loved the placement and functions of the buttons.They were all right where they needed to be.On the hx2415, it's even better because the buttons are designed so that it is not as easy to accidentally press one of the buttons, especially the voice recorder. Aside from infrared on the 3635, in order to do any type of networking with my iPaq, I needed to get add-on cards, which I didn't want to do.The hx2415 takes care of all of your networking needs - from infrared, to Wi-Fi, to Bluetooth.It has it all. 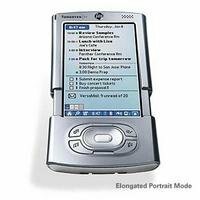 HP has included great applications that I found were very easy to use.I guess being a previous owner of an iPaq helped too.But it won't be a problem for those just buying their first PDA either. This is probably the only thing that I wish would have been better on the hx2415.The sound is not what I'm used to on my 3635.The speaker was a lot bigger and produced a much louder sound.I very rarely had the volume maxed on it.With the hx2415, the volume is all the way up - all the time. Overall I am smitten with my new iPaq.I paid over $500 for my 3635 brand new (with cradle, charger, case, and expansion sleeve).I found this hx2415 for $370.00.What a deal!I couldn't be happier. One thing I would like to mention, which isn't a problem with the iPaq as much as it is a problem with the PocketPC interface.I recommend you get a third-party management utility, such as Wisbar.It makes using the iPaq so much easier and fun.One thing I dislike (and probably most PPC users do as well) is that when you open an application, such as Pocket Word, there is an 'X' button to close the application.However, the 'X' button is more like a 'Minimize' button because the program is still active.You have to navigate through the settings control panel and close it from the running programs in the Memory task panel.So much of a hassle.But not with Wisbar.You'll be glad you did! I'm sure I'm leaving some other great features out, but these are what really drove me to buy the hx2415.Hope it helps you in your search! Great PDA. Sync perfectly with my home and office computer. Connect anywhere you have Wi-Fi access - at home, the office or at hotels, cafes and airports using Wi-Fi (802.11b, channels 1 - 11) technology. Send and receive email, browse the web, even wirelessly synchronize with your computer. Under normal operating conditions, I have no issues regarding this WiFi card, which I use in a Tungsten T3.While the battery drain is a bit high, it still performed very well... Until... The big problem I got from using this device was a "Fatal Exception Error" that seemed to rise out of nowhere, requiring a hard reset.This is an exceptionally big problem if you have any sensitive information on your device - I used mine for storing some encrypted data.It's amazing how little PalmOne has done to help.Their website offers little information (they say to do a hard reset - thanks for the great tip! ), and their support line is no better.My advice is to not bother with any PalmOne products if you are looking for a WiFi device - get something more reliable.I hate to say this, but I feel like PalmOne is headed downhill FAST, thanks to their poor customer responsiveness. Excellent Card but watch out for "Fatal Exception"
The card is spectacular and fast with great range.One reviewer has mentioned that the range is half that of his laptop.My card, for whatever reason (maybe I'm a giant antenna or something) gets better range than my Lucent/Orinoco 802.11b Wi-Fi card, so range is pretty comparable to most laptops in my case.The card is a snap to use, installation is great. All in all this is well worth the cost and definately worth the other $40 for the Power To Go.Too bad the browser is so slow, but AOL Instant Messaging is very fast and great for college students (I'm a graduate student and use it to IM a lot). Installation was trivial, worked first time. From reading earlier reviews, I was aware that this thing uses a lot of power -- not a big deal for my situation. Minor quibble: It would be nice to have a plastic container for the card, to protect it when not in use. It's larger than a "normal" SD card, and needs a custom container. I plan eventually to get a hiptop (Oqo, Flybook, or the like), once they settle out, probably a year or two. In the meantime, the Zire 72 with WiFi and a big memory card fills the bill. This works fine and I was happy with the speed at which I was able to do a Google search with the bundled software WebPro.Downloading email using the IMAP server was a little slower than using the web, but it worked out quite well using the T3's VersaMail email software. 1)The range is about half that of a laptops WiFi card.But it's still good enough that if you're inside a Cafe or on the sidewalk outside a WiFi hotspot, you'll have no problems. 2)It uses a lot of juice...But that's to be expected for something like this.Realistically though, you probably won't spend as much time surfing the web with this device as you would with a laptop.You'd do the occasional quick surfing, as well as downloading email, so battery life is probably acceptable for a majority of users. If you do need WiFi on your PDA, then you'll be very happy with this. What's in the box: Handheld device; Palm Desktop software, including Documents To Go and Adobe Acrobat for Palm OS; all basic utilities such as Calendar, Contacts, Tasks., etc. I wanted to try it out, I did and now I know. - First for the good points: it's practical to have an electronic agenda - although good old fashioned scribbling by hand onto paper is more convenient than typing in letter by letter on the tiny keyboard or using the handwriting application. It's practical to have all your addresses incl. telephone nos. and e-mails always with you. It's pleasant to listen to mp3's while sitting on the train or waiting for a plane. - Now for the bad points: The making is rather flimsical. Forget about going into the internet while on the go. Most webpages are not made for it, especially the interesting ones. The only thing that goes is reading news - but you can as well read a newspaper or wait until back in your hotel room and turn on the tv. You don't want to recieve e-mails while sitting in a taxi in Jakarta (if it works in the 1st place). If it's urgent they'll call you. Otherwise you can certainly wait for the next opputrunity to hook up your notebook somewhere. SMS function doesn't work with Nokia 6230 (one of the best mobiles according to test results). Dialing function doesn't work either. You definetely don't want to use Word, Excel or Powerpoint with this thing (unsless you want to carry around a magnifying glass). Downloaded some games (made sense to me to listen to mp3's AND playing chinese chess while hanging around airports) but installing didn't work within one hour and I'm not interested in spending another hour finding out why. You don't want to look at photos on this thing (well, again the magnifying glass comes to my mind). I didn't try the movie solution because I refuse to carry that magnifying glass with me. Palm's webpage is a maze (in particular when it comes to support). Customer support is awkward. - As an alternative I suggest you buy a simpler solution with merely an agenda, an address book and mp3 function (you hear me Steve?). Games maybe? Why a T|T3 is still a great PDA as of May 2005.
volatile RAM; that argues against the 16MB limit of the TH55 and, perhaps, the 32MB limits of the T|Es. The T|C appears to be an important contender, but I prefer the security of short-range Bluetooth to 802.11b WiFi without WPA-PSK/AES. Also, it is likely that unencrypted 802.11b violates HIPAA. be a database or have the feature sets of office productivity suites. Still, adding research info. management to medical info. management increases demand on volatile and non-volatile storage.This argues for the T|Ts, the T|C and the LifeDrive. More on (c): I want my PDA apps to be useful day-to-day, quick to launch and nimble to use.Keeping this in mind, I was disappointed that PalmOne did away with voice recording on the T|T5.I like the idea of using voice recordings for quick memos while driving or just before going to bed or adding voice-over notes on calendar and to-do apps. The T|C will do voice recording, but with the hassle of an external mic.Unfortunately, that little hassle could be too large a barrier to my using a voice-memo feature regularly. That takes me back to the T|T3. The Treo 650 would be a reasonable contender. But I like my PDA to be available for scheduling and note-taking while I am talking on a cell-phone. So for me, the two should be separated.Besides, I've recently signed up for another two years with Nextel. That excludes the Treos. In the back of my mind is also the fact that cell phones aren't compatible/safe with many hospital wards.Unfortunately, as of today, there precious few sources of new, warrantied T|T3 available in the US.Amazon & associates just sold the last of the warrantied OEMs; I squeaked by and managed to get one of these. Ebay may be the only remaining source. I bought a spare T|T3 and some spare parts from ebay last week and I've been happy with this route. To conclude, I assert the T|T3 is still a great PDA as of May 2005. Great product, except for the screws! Great product! My wife works in real estate, so the Tungsten T3 is invaluable to her. Easy to use and durable EXCEPT for the 4 little screws on the side of the slide part. They are NOTORIOUS for coming loose and falling out.They are so tiny that you do not even notice them come loose untill they have fallen out and are gone. However, I have contacted PalmOne and they graciously sent me 4 new screws for no charge. Great customer support! Caveat emptor: I, too, had the same problem when attempting to run the Universal Wireless Keyboard (UWK) with my T3.Apparently, you have to download an updated version of the Keyboard.prc (located on Palm's website) and install that along with two other prc's that came bundled with the UWK installation CD.In my case, my T3 actually froze and would not even respond to a hard reset.But I called Palm's tech support, got it exchanged, uploaded the other prc's, and it's been working brilliantly ever since. Aside from that little hitch, I highly reccommend the T3.The expandable view screen and landscape mode definitely evoke that "Wow" factor.And functionally, it's great.I'm a student, so I've started taking all of my notes on my T3.Here's where the landscape mode really comes in handy.And now that my UWK is working, it's easy as pie. I should add that warnings about a low battery life are right.It does seem to run down pretty quickly.I got a travel charger to add some juice in between classes, which seems to work fine and doesn't take up a lot of room.So I reccommend getting either that or an attachable battery if you plan to be using your T3 extensively during the day.I believe the average battery life is 4 hours without a recharge (less if you plan to be browsing online or using the high media apps like the Kinoma player). The T3 is a very nice machine, but with a serious design flaw. And, it is very poorly supported, a bad combination. The Palm Universal Wireless keyboard comes with an application with a serious bug such that if you attempt to run it on the T3, it will hang the T3's ROM code. Unfortunately, the T3 is designed so that a soft or hard reset requires the attention of the ROM code, which in this case is completely catatonic. So you cannot regain control of the machine, rendering it an expensive paper-weight with a white screen (hence, the term "White Screen of Death", which others have called this syndrome). (In my 40 years as a computer pro, I've never encountered a machine where you could get the hardware in such a wedged state that a reset button or power-cycling wouldn't return the hardware to a good, if re-initialized, state). You can wait for the battery to die (I sent mine back to Palm 6 days after this event, and the battery was still alive). Or you can do a little surgery on your nice T3 to disconnect the battery connector from the mainboard. Or you can try to get Palm to replace the machine. I chose the latter, and believe me, it wasn't easy. After a couple of calls to support that got me the folks in India, who told me the only remedy was to let the battery die, and when it didn't, I finally called the main number at Palm and screamed bloody murder. They did an advance exchange. So the outcome was fine, but it took me an awfully long time on the phone at my own expense and a lot of aggravation to get them to fix the fact that THEIR software killed THEIR machine. Want a laugh? They released an updated software package for the Universal Wireless keyboard without a word on the website saying that if you don't switch to this upgrade, you will kill your T3 dead. I did install the updated stuff, because I'd like to be able to use the keyboard I paid for. And guess what? Try to run the app and it crashes (the driver works, so you can use the keyboard; you just can't change any settings). It is improved, in that you can recover from the crash by soft-resetting. This is quite unbelievable. And it would be nice to be able to run this app, because with the keyboard driver installed, battery life, not a T3 strong-suit, is compromised because the driver is constantly probing the IR port to see if there's a keyboard there, consuming power in the process. For me, this is bad, because I use the keyboard only once/week. The app supposedly lets you control this behavior to save power, if you can run it, which I can't. This is my second GPS and 3rd or 4th PDA so maybe it was easier for me than it would be for others.But, I found the iQue 3200 to be a great product.Super easy to install the software on XP PC desktop, load the maps to a 512M SD card (purchased separately) and hit the road.I loaded 1/3 of the US on my card and tested routes to my church, son's school and wife's office (all of which were listed as "places of interest" on the maps) in less than 10 minutes. I did a lot of research and would buy it again in a heart-beat. This product needs to "GET LOST"
Sorry...I REALLY wish I could write a good review of this product, but if possible, I would be rating it with LESS than 1 star.I am extremely disappointed and currently packing it up for return. All previous reviews (until May 3rd) for this product were good so I was excited.However, upon receipt of the product and attempts to install it, I ran into many of the same problems that the reviewer below did and have been trying to get this product to work for 2 weeks with absolutely no luck and nothing but frustration and the run around by the manufacturer. I even hired a computer consultant with lots of experience installing similar products and he said that he has never had such a problem with a product before either. 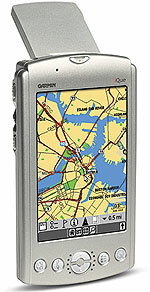 This is a great idea.The idea of have maps in a PDA device is super.The hardware is very good and high quality. The software and documentation, unfortunately, leave very much to be desired.The documentation and the hardware display often do not match.For example, when explaining how to use GPS, the documentation refers to taping a QueGPS icon.Unfortunately, there is none.You find that the icon on the screen is called GPS.There are many other instances of sloppy, confusing and vague explanations.The softwareis very geekie, assumes that you know what is not disclosed in the guides and is monumentally frustrating because of the poor documentation.Oh, did I mention that it takes forever to download because of some of the dumbest programming imaginable and an even dumber user interface? An early indication of the poor documentation is that when you are confused by the missing, confused, vague and contradictory explanations given by Garmin and you go to the website, you find more than 50 FAQs.Many of these FAQs do not clearly explain what is necessary and are themselves vague and confused.You rapidly become more and more confused. If you try to load maps on to your SD card and there is not enough space on the card, the download software executes the entire download process to conclusion (which process may take 30-45 minutes to complete) and passes you a message that the process failed because there was insufficient card space.There is only one word to describe such programming: STUPID.Any journeyman programmer that would not query the SD card and compare the empty space vs. the proposed download maps show be fired.At Garmin, he was apparently promoted to the software documentation section to make havoc over there. If you load maps for one part of the country onto your SD card and then try to load e.g., Topo maps for your vacation for another part of the US, you find that SURPRISE! your home state or region maps have been wiped out even though there was plenty of space on your SD card.This is another instance of STUPID programming that wastes hours of time. The Maps:The maps are detailed and, when loaded and the hardware works, do a fine job.However, whoever conceived the download procedure should be tortured with Chinese water tortures for eternity. If you want to download the maps of an entire state (or horrors! a region like NY, NJ + CT), you have laboriously to load minute sections of each state map (examples: the upper Bronx for NY State; a section of Queens, etc.). The result is that if you want to load a few states, it can take 30-45 minutes of repetitive clicking to get them set up for downloading and you risk repetitive stress syndrome.Then the download process takes another 15-45 minutes.Can you see why it is an outrage to go through this entire procedure only to be told that it failed because there was too little SD card space?Hello, Garmin this is DUMB, DUMB, DUMB and needs to be fixed. Why there could not be a "lasso" command to allow you to grab the maps of an entire state or region is not explained.This is just silly programming. Of course, if you want to keep two sets of maps (City and Topo) on your SD card, that cannot be done so you must waste more time re-clicking and re-downloading.Is there any rational life in Olathe, Kansas. The hardware is good but nowhere can you find what cables and other things are in the box (Shhhhhhh: It's a Garmin secret; Garmin won't even disclose it on the website. )Consequently, you may buy accessories that you do not need like I did. Conclusion: nice idea but the documentation and software need a thorough revamping.Garmin has produced so many GPS systems in the past (there is a list on the website with scores of them - did you know that Columbus used a Garmin GPS system but the interface was so bad that he landed in the new world? )that this junkie, kludgie, stupidity prone software is unforgivable. If you are unemployed, retired or have a great deal of time and the patience of a saint, this is a good device.Otherwise, run for the hills! I purchased the iQue 3200 2 months ago and have really enjoyed using it.It's easy to set-up and get on your way.The maps are very detailed and I'm able to find most of the things within its database of commercial businesses.My only complaint is that you can't re-label a food establishment to say a gas station or hotel to a hospital. Navigation system works flawlessly and the screen is more than adequate to read as it automatically zooms in when coming up on a turn.The navigational voice is clear and easy to understand and it's already saved me time in knowing the exact route to my destination and re-calculating a new appointment (I'm in sales).Fits well in my car and overall I'd give it a 4.25.It'd be nice to have longer battery life and Internet capability, but for my use, it will suffice. My girlfriend and I are avid campers.Preferring maps to megabytes, she was skeptical when I added a Garmin iQue 3200 to our gear kit.Her doubts melted away when the unit delivered us to the gateways of half a dozen obscure Florida state parks with ease. I'm no fan of complex electronics, and apparently neither is Garmin.The unit is simple to set up and install in a vehicle.It has a pleasant yet commanding voice -- we call "Jane" -- that frees us of having to look at maps enroute, so we can truly enjoy our adventures. A 256 megabyte card is more than adequate for our southern trips. When we branch out, I'll just add more cards. In addition to travel, I intend to use the unit in my new real estate career.With Jane prompting me, I'm confident I'll be able to spend more time focused on my clients, which is the key to sales.Being able to store addresses as waypoints is invaluable. The PDA, itself, functions fine.There is a little lag when writing, but I'm not exactly a speed demon when it comes to using graffiti anyway. I installed the upgrade hoping it would end my frustrations.Nope!It's not usable as a phone.It drops my calls 80% of the time.When not dropped, the reception is barely intelligible. I've had my 3615 replaced by T-Mobile 4 times.Each time a replacement (refurb.) comes it has the same phone problems and various other issues such as lock ups, involuntary resets and so on.When pointing out the futility of replacing a junk 3615 with another 3615, my friendly T-Mobile rep. sticks to his impenetrable script and says he would be glad to help me solve my problem by sending me a fully tested 3615 replacement. My other favorite problem with this outrageous piece of junk is the relationship between HP and T-Mobile.HP refers you to T-Mobile when asking for support.T-Mobile says "we depend on HP when trying to resolve these issues".Seems like neither one wants to take responsibility for it and are waiting for the whole thing to fade away with time (and warranty expirations).Shame on both! You wanna get miss call? Just I wanna say this this is not a good phone but nice handheld. I am using this ipaq almost a year and last month t-mobile sent me new one because I was getting too many miss calls then tey sent me new h6315 but guess what, nothing is change still I am getting miss calls:( I think I am going to buy new "cell phone" . Do not buy this device if you use expect a decent phone.I have used many HP iPAQ PDA's and they are great and this one is as well for that purpose.The phone; however, is barely usable.It is not at all convenient to use, the call quality is absolutely horrible, it drops calls on a regular basis, and half the time it doesn't even ring until making one single sound just before going to voicemail. I was excited a couple of months back when HP/T-Mobile release a ROM upgrade that was supposed to fix many of the problems with the device.I installed the upgrade and IT GOT *MUCH* WORSE!Unfortunately, I couldn't find a version of the old ROM image to downgrade it back to, so I was stuck with it. After painfully using this phone for 7 months, I finally had enough and paid full price to purchase another phone a couple of weeks ago.I'm tempted to just throw my 6315 in the trash! Save yourself some time and just take the money you are going to spend on this phone and flush it down the toilet and then go and buy another cell phone. Some of the problems with this phone are: The phone locks up on a regular basis.Since the phone is listed as a Tmobile compatible phone you would think that you could use the Tmobile website for downloads, think again, you can not use the tmobile website for any downloads. If you buy this phone with a tmobile service plan it will end up costing you way more than you think. You will sign up for a plan and find out later that something you need is not included and will cost at least another twenty dollars for that service. When it is all said and done yu end up spending twice as much as you planned. You will get messages from websites or numbers you have never heard of and that are not full numbers so you can not call them back and ask them to stop the messages. To make it worse most of the time the messages don't say anything. You figure out how to stop the messages and take the steps to put a stop to them. Then while you are in a meeting you start getting the messages again. There are websites that you visit to try and download things for your phone, only to find out that your phone is not compatible and no matter how many times you cancel your account you will continue to be billed for the site. As for actual phone service if you sneeze or turn your head your service will be dropped. Don't plan on talking to anyone very long. If the only choice you have in your area is T-mobile and this phone, you may want to take two cans and run a string between them and use that. It is cheaper and the service is better. Having a phone and pda combined into one unit is a good idea but not one that actually translates into something that works for t-mobile.I'm don't know how this phone would preform on other networks but ont he t-mobile network it never worked properly.Unless you were in your house or driveway you won't get your calls.The calls will go directly to voicemail, and the phone will not ring becuase of low signal. Even after applying the free upgrade offered from HP through the t-mobile website the phone did not work properly.This ended up being a waste of $600 for me. The compter part of the pda works great. Playing games, keeping my calendar and task list was about all I could do on this phone. Surfing the net was impossible unless you purchase the $40 plan from t-mobile.The phone has a wireless card in it but it never worked properly with my home network.Also the bluetooth never functioned properly for transferring data or using the buetooth handsfree.the infrared transfer worked fine. The camera was another disappointment. It was supposed to be a 3megapixel camera but it did not take pictures like one.The shutter reaction is extremely slow and the pictures were very graining.There is a $9 flash attachment that you can purchase but I didn't want to spend anymore money on this item. Me and my brother got each one Z72 in xmas and we basically have the same problems. At first I was very excited about this little thing and got my life around it quite fast using it as organizer, as a book reader with Palm/Acrobat reader, and as a messenger used in conjunction with my phone. Then, problems started and it got slow, continously crashed and needed a complete reset. As mentioned in other reviews changing for a new one did not solve the problem and if you thing the technical services in the US are slow with 8-10 weeks, try it in other countries. The screen of this device is very very delicate. I say too much for stylus input. My Palm got its screen shattered with no reason and my brother's seems to be ok but no input with the stylus is posible. Meaning other 4 full months in not covered by warranty service awaiting for both palms. This is a really neat item,But I had alot of problems out of it,I transfer all of my appointments and phone book on to it and it crashed and I lost everything I wouldn't buy this one it's not very compatiable with XP,I called palm and you have to send it back to them,and it took 8 weeks for a new one that did the same thing!!! I got the Zire 72 for my birthday and I absolutely love it.The camera is pretty neat, the mp3 player is totally awesome, and the video recorder is beyond cool.I only had a few complaints. To connect to the internet you have to buy a $40 bluetooth thingy to attach to your computer, you need to buy a extra memory cards for the videos and mp3 feature. But other than that, the calender is nice, I like having an easy-to-manage address book, and the camera is awesome.The combination of the features add up to an IPOD plus more, so it's a better value. This was my first PDA purchase and I've been very satisfied. I have used this to arrange my complicated schedule and find it easy to use. I've read reviews given here at Amazon.com and haven't experienced any of the complaints others have. One of the most gratifying aspects is that the Zire72 retains its value. I've owned mine for about six months and I still find the price has remained the same. In a world where technology is always changing and electronics are becoming obselete in a few months, this is very reassuring. I had a Zire 71, and I think this is a great upgrade. It has more memory, and I like the camera much better. The 71 camera was used by pushing the body up to snap pictures -- a feature I didn't care for much. This one is always ready to snap pictures. Plus, it takes movies with sound. I love capturing the moments of my four-year-old as he grows up. I don't care for the zoom feature -- the picture is closer, but very grainy. Otherwise, the camera is great for on-the-go. The additional memory card feature allows you to store as many photos as you might want to view; however, more photos stored means more of a time-lag in accessing them. Even so, it's only a few seconds, even if it seems longer. It also comes with Real Player, for playing MP3s. I don't use it a lot, but sometimes it's nice to have. Usually, if I listen to something on the Palm, I use Audible.com files, as they take up less filespace. But if you're so inclined, additional memory cards help out in accessing your MP3s whenever you feel like listening. The battery isn't extremely long-lasting, although it does fairly well. Be sure to set the display to go off while you're listening, however, or you'll burn through the rechargeable battery a lot more quickly! Documents-To-Go is also part of the package, making it easy to synchronize with Excel and Word documents on your PC. It also comes with Versa-Mail so that you can synchronize with your Outlook Mail. I tried it and found it merely annoying, but if you're using it for work purposes and need your mail at your fingertips, it might be of more use to you. One problem that I did have was in my initial synchronization, I could no longer access my memory cards. After messing around with it for a bit, I found information that this can happen with certain 3rd-party programs installed on the 72. I then did a hard reset and reinstalled 3rd party programs one at a time. Once I had the programs installed that I use most frequently while still maintaining access to my memory card, I stopped reinstalling. I'm not sure which program it was that gave me the problem, but I can tell you it wasn't HandBase or Moon Phases or Solitaire or any of the packaged programs.